Will it be too difficult for me? Will it be too easy for me? Do I have to follow the trails? Why are the trails coloured? Can people with Cystic Fibrosis enter? Yes. Teams are made up of two or more people who work out their route and find flags together. They share one route card and have a team score. No. You run at your own pace and can stop to rest as often as you like. Walkers and children can enter the one hour walk category, there are 20 flags to find within 1 mile of the start. No map reading skills are required as the trails are clearly marked with coloured flour. Unlikely. There are 20 miles of marked trails with 1,000ft of climb to enjoy. Higher value flags are more distant and across more difficult terrain. You must follow the countryside code and stay on public footpaths, bridle-ways and roads. Staying on the marked trails will also give you a chance of finding the five hidden flags that are positioned on them. The footpaths are marked with coloured flour to help you find your way to the flags using only the simple route card, a bit like coloured poles on a ski run. The colours indicate the flags you will find on each trail. You can follow any trail in any direction. The Mendip Mashup is based at the Charterhouse Centre on the Mendip Hills. The trails will be set down Velvet Bottom, across the open moorland of Black Down and through the woods of Rowberrow Warren. There is no set distance. You choose to compete for 1, 2 or 3 hours and run or walk as far as you can within that time. 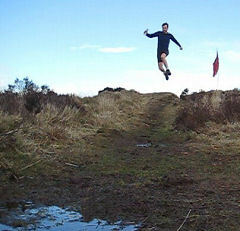 You will need off-road running shoes if running or walking boots if walking. A route map and pencil will be provided. The Charterhouse Centre has great facilities including showers, camping, bunkroom accomodation and a dining hall. On Saturday night there will be a race supper, bar and music. Breakfast will be available on Sunday morning. Water stations will be provided on the course. Entry fees start at £12 if you enter early. Bunk-bed accomodation is available in shared rooms in the Charterhouse Centre from £40 per room or you can camp in the field from £5 per tent. Full price details can be found here. How much of my money goes to the Cystic Fibrosis Trust? 100% of entry fees and meal payments are passed direct to the Cystic Fibrosis Trust. Event costs are covered by profits from bar sales. So far we have raised £4,000 in 2008, £4,500 in 2009, £5,000 in 2010 and £5,300 in 2011. People with cystic fibrosis can enter the Mendip Mashup but should be aware that there may be others also in attendance. The CF Trust has developed the following guidance for people with cystic fibrosis in relation to outdoor events. Please make yourself known to organisers so that we can help you avoid contact with others. You are strongly advised to discuss your participation in any event with your CF consultant.